This is from last year, but it holds true always. I'm hoping that by moving in to our new home, we can make many more favorite Christmas memories. Happy holidays to all!! I've not made it a huge secret that the month of December depresses me (and April, June, September, and October, but those are beside the point right now). I wish it didn't have to be that way because I really love Christmas; but when you're missing someone so much, it's inevitable. 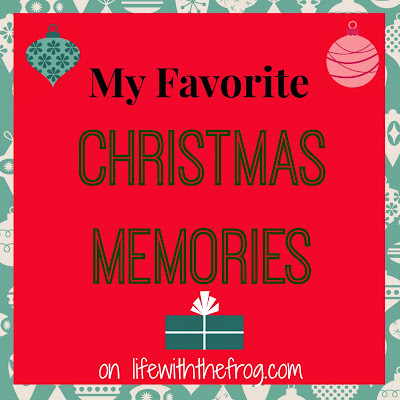 So, in an attempt to put myself in more of a Christmas spirit, I've been thinking about some of my favorite Christmas memories, and I want to share them with you. When I was growing up, we lived in a teeny, tiny house. My sister and I shared a room in the attic, and our only bathroom was in the basement. Every time I had to go to the bathroom, I would wake my sister up so she could go with me all the way downstairs because I was scared. One Christmas Eve, long after my older sister had stopped believing in Santa Claus, I woke her up to take me to the bathroom. She knew that the presents were already under the tree, and she didn't want me seeing them. So, she walked with me down the stairs, through the living room, and back again with her hand over my eyes so I wouldn't see the gifts. She still talks about that. And it's one of my favorite "Big Sister" memories. I also remember that we went to Midnight Mass almost every year in our Catholic school gym. It was hot and dark and I could barely keep my eyes open I was so tired, but I loved it. We were allowed to open one present before we went, and mine was almost always a small piece of jewelry from the Avon catalog. I will never forget one year, the man next to me farted during mass - an SBD (Silent But Deadly) - and it ruined mass for me. I can still picture that dude's corduroy pants in my mind. 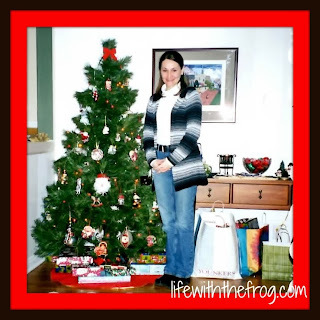 My second married Christmas, Hubby and I were in our first home. It was a darling little 1950's brick home with wood floors and lots of character. I remember exactly where we set up our tree and the ornament he gave me. He had started a tradition of giving me a glass ornament the year before. I remember hanging another ornament on the tree, a streetcar we had picked up in San Francisco in the fall. We had the artist write "The Glows" on it in anticipation of our first baby. But sadly, I miscarried two weeks after our trip. We started our traditions of going to Christmas Eve mass, eating crab legs, and watching "It's a Wonderful Life." Hubby had never seen that movie before he met me! The Christmas right before I had the twins, I was HUGE! 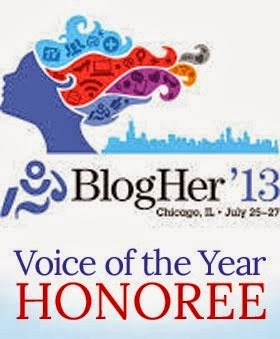 I was on bed rest, and I had a terbutaline pump strapped to my leg delivering meds 24/7 keeping me pregnant. Despite that and the two other medications I was taking to prevent my contractions, I was still having them constantly. We were at my parents' house and playing cards after dinner as we usually do. Of course, I had to get up to go to the bathroom, and when I came back and sat down, a very loud farting noise came from under my chair. Everyone said, "Kathy! Oh my god, I can't believe you did that!" I was mortified. I kept denying it, but I was laughing so hard at the same time. The farting noises continued, and I felt my belly tightening up. I really thought I was going to go into labor. I think my mom thought so, too, because she finally outed my former brother-in-law who was remotely controlling a fart machine he had placed under my chair while I was in the bathroom. I didn't go into labor that night, but I did a week later - six and a half weeks before my due date. 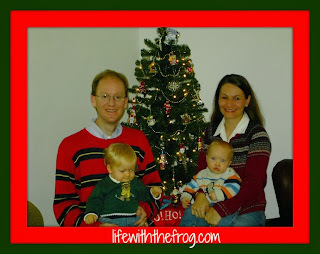 Our first and only Christmas away from home, was the very next Christmas when Hubby, the twins, and I were living on Long Island. 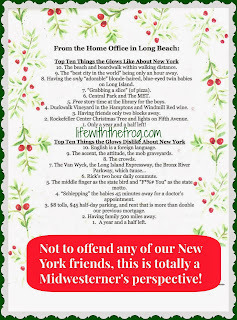 I can't remember exactly why we didn't fly back to the Midwest - whether Hubby was on call or we just didn't have the money - but I was really, really upset that we wouldn't be spending the holidays with our families. We got a tiny little fake tree and put it up in the corner of our rented apartment. We kept holding up eleven-month-olds Joey and Slim and showing them the twinkly lights. 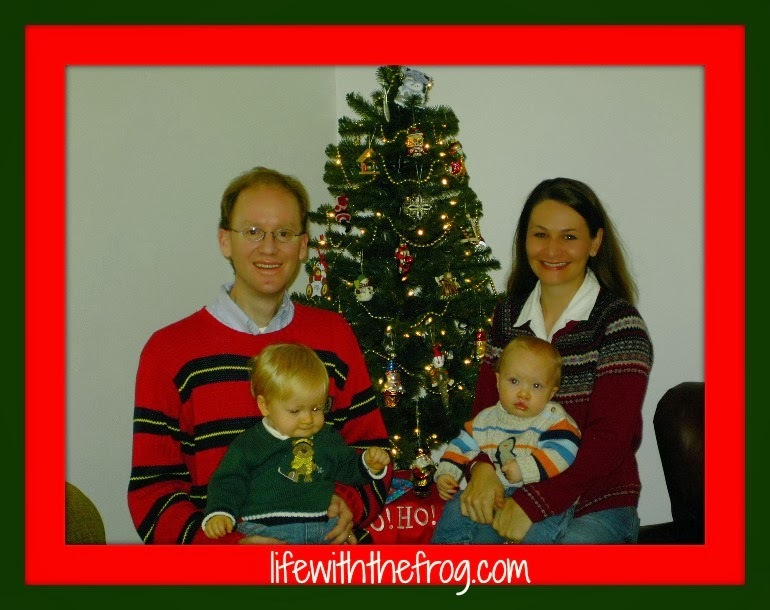 We tried our best to take a family selfie for a holiday card, but it kept coming out blurry and the boys' eyes looked like they were possessed. 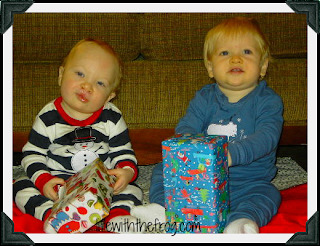 We finally settled on a darling picture of the two babies in cute holiday jammies playing with gifts, and we created a holiday "top ten" a la David Letterman to send back home to friends and family. We still talk about that list. It was epically funny (maybe only to us, but we loved it). The best part about that Christmas was that we proved that we could do it on our own - the holiday and getting pregnant again. After undergoing fertility treatments for Joey and Slim, we found out on Christmas Eve that we were expecting Knox. And I said to Hubby, in no uncertain terms, that we would NOT be spending another holiday away from family. 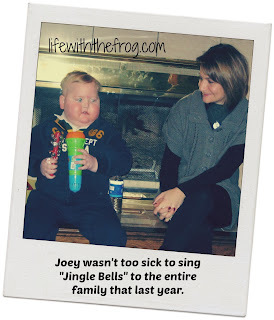 Our last Christmas with Joey was so, so hard. Honestly, I don't know if it is worse when you know it will be your last or when you don't know. Someone on the other side will have to tell me. 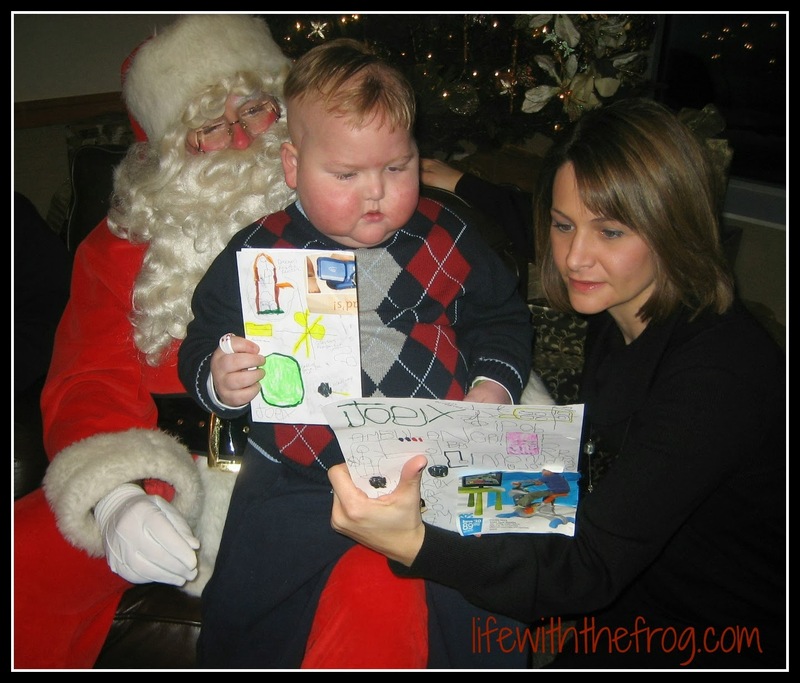 During Joey's illness every holiday, every special day, every marker on the calendar was met with breathless anticipation - would he make it or not? Would he be here to celebrate with us or would he be gone? In the month leading up to Christmas, Joey was busily preparing a Christmas list. He was cutting pictures out of magazines and color coding the double-sided paper. When it was his turn to sit on Santa's lap, it took forever to go through that list, but everyone sat patiently and watched him. 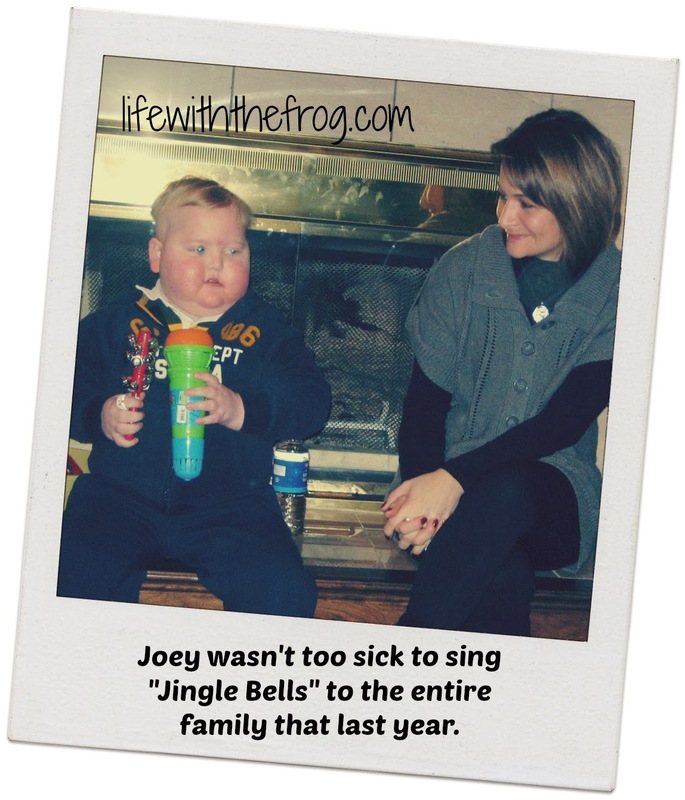 At both Hubby's side of the family and mine, Joey sang "Jingle Bells" to the crowd, shaking a set of bells that Lil' C had received for a gift. We hung on every word, every shake of those bells. When the holiday was all said and done, his gifts sat untouched in his closet. For some unknown reason, he took his gifts upstairs after opening them and they sat there until after his death. That is one of the mysteries about what his disease did to him that will remain unsolved. I feel so lucky that we got one last of every holiday and birthday with Joey. We have our one last memory of and with him, and that's so important. Since he's been gone, I've had such a hard time finding joy in the big moments. I can find joy in the smaller moments, the every day moments; but the "big deal" days are hard. I just need to remember that Joy is one letter away from Joey, and that the memories he left us with will always be strong sources of joy for us (<----every time I type 'joy', I accidentally(?) type 'Joey'). I'm not sure I will send out holiday cards this year. I just don't really have the energy. There is no good reason at all - I just don't feel like it. Although, I did get my first two cards today and thought maybe I should. Nothing will beat our holiday card from last year, though. My mother recently reminded me that I do have four other children for whom to make the holidays special. I know that, I do, and I will try. I want their memories to be filled with Joy, too.